Stainless steel fry tank, 65-70 lb. capacity. 1-1/4" full port ball type drain valve. Stainless steel front and door. Door liner for added stability. Set of four nickel plated legs adjustable to 7". Behind the door snap action millivolt thermostat control adjusts from 200° to 400°F with standing pilot. Millivolt System - Requires no electric hook-up. Hi-limit shut-off protector shuts off gas combination valve and standing pilot. Earth magnet to secure closed door. Easily removable stainless steel basket hanger for cleaning. 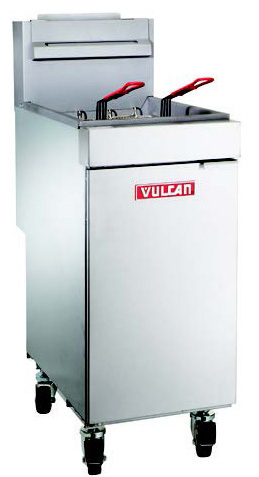 Vulcan-Hart (Vulcan) / Wolf Range warrants the LG500 Gas Fryer to be free of defects in materials and workmanship for a period of 1 year from the date of original installation. Stainless steel fry tank will be warranted for 1 year. If tank is found to have a leak and is verified by an authorized service agency, the entire LG500 fryer will be replaced. Replacement fryer will be warranted for the balance of the original warranty. Single large basket - 13"w x 131/4"d x 51/2"h.
Set of twin baskets - 61/2"w x 131/4"d x 6"h.
FRYMATE - VX15 add-on Frymate™ Dump Station. Flexible gas hose with quick disconnect. Note: Casters may be ordered at time of purchase and we offer a 4 locking caster set for immediate shipment separately. Stainless steel fry tank, 45 - 50 lb. capacity. Vulcan-Hart (Vulcan) / Wolf Range warrants the LG400 Gas Fryer to be free of defects in materials and workmanship for a period of 1 year from the date of original installation. Stainless steel fry tank will be warranted for 1 year. If tank is found to have a leak and is verified by an authorized service agency, the entire LG400 fryer will be replaced. Replacement fryer will be warranted for the balance of the original warranty. Stainless steel fry tank, 35 - 40 lb. capacity. G90 high grade galvanized non corrosive finish sides and back. Vulcan-Hart (Vulcan) / Wolf Range warrants the LG300 Gas Fryer to be free of defects in materials and workmanship for a period of 1 year from the date of original installation. Stainless steel fry tank will be warranted for 1 year. If tank is found to have a leak and is verified by an authorized service agency, the entire LG300 fryer will be replaced. Replacement fryer will be warranted for the balance of the original warranty. Free shipping on Vulcan and Wolf Equipment to commercial destinations with loading dock in the continental U.S.